The name Bessie Lowell is handwritten on the back of the above photo. Bessie ordered 2 copies. No further information is provided. Click on either photo to see a larger image, and then click again to zoom in even closer. 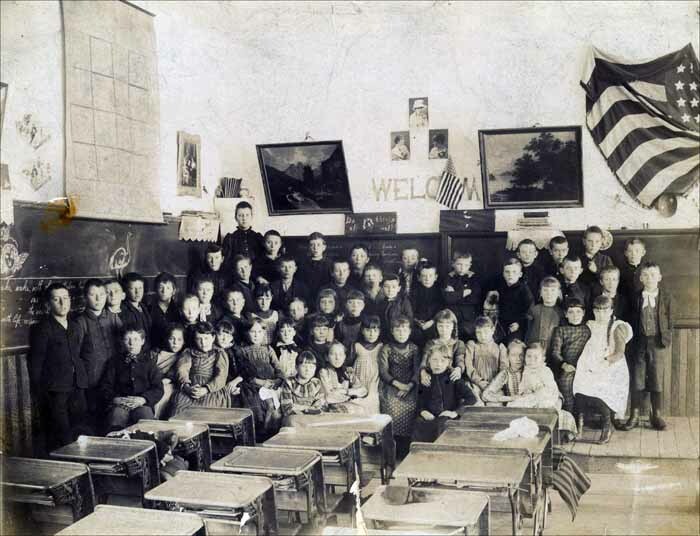 School class at Anita, Iowa, year unknown. Third and Fourth Grade assignments are written on the blackboard in the background. A name is written on the back of the photo, but the handwriting is difficult to read. Last name definitely appears to be Falkner. Possibly Mrs. W. H. Falkner? Back also reads "1 copy same as original." A scan of the back is included below. To help with identification, please contact the Cass County Coordinator. Click on the photo to see a larger image, and then click again to zoom in even closer. 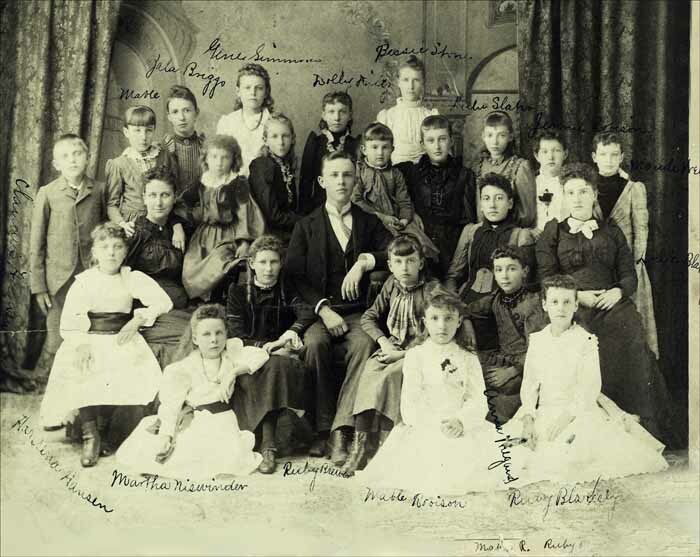 Another vintage school photo from Anita, Iowa. This photo has names handwritten on it. 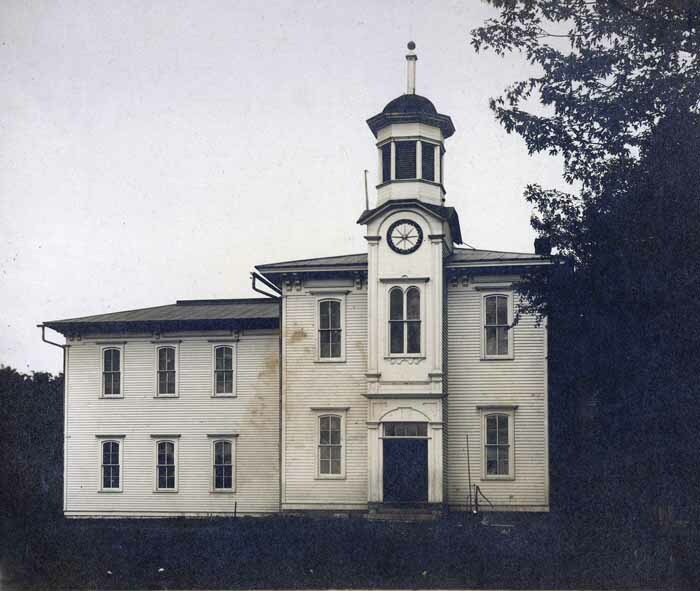 No year is provided, but it is believed to be circa 1890 based on the apparent age of Dollie Dilts, who was born in 1881. Starting with Ruby Brewer in the front center and going counter clockwise: Ruby Brewer, Mable Robison, Ruby Blakesly, Anna Wigand, Louie Blakesly, Maude Well, Jennie Robison, Lulu Slate (or could be Slahn ? ), Bessie Stone, Dolly Diltz (sic - should be Dilts), Gene Simmons, Zala Briggs, Mable, Charles Hansen, Hansena Hansen, Martha Niswinder. Two names are written in the bottom right corner: Mable R. and Ruby B. On the backside some additional names are written: Mrs. Lowell, Anna McKinley, Myrtle Sears, Louie Blakesly, Gene Simmons.